Groundhog Day, this past Saturday, brought some opposing prognostications about the arrival of spring. In either case it will be six weeks until spring begins, but it’s a fun tradition. Punxatawney Phil, a PA celebrity, predicted that spring weather would arrive early. That’s good news. 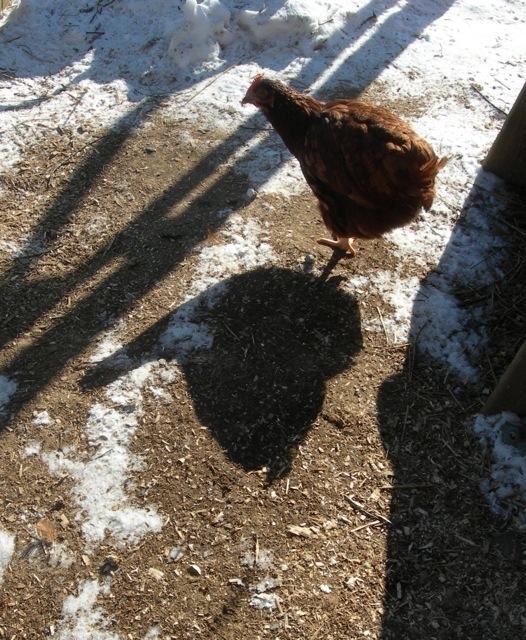 However, my hen, Charlotte, saw her shadow, so she’s predicting six more weeks of winter. Only time will tell. This past week consisted of cleaning and straightening my studio. 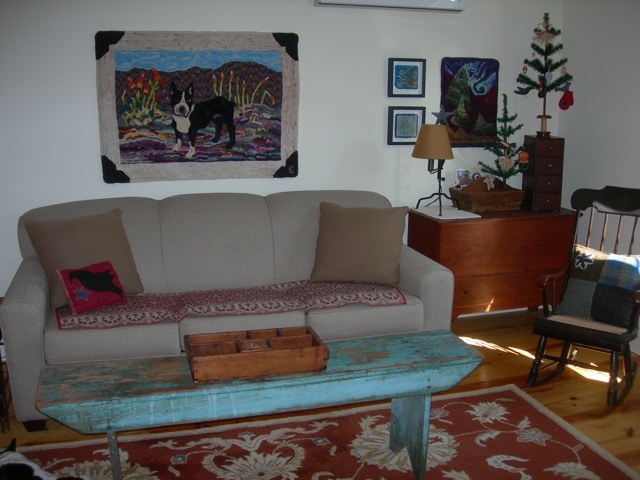 My first priority was organizing my paper patterns from which I make my hooked rug patterns on linen backing. Some of my “working patterns” [as opposed to the original drawings that I keep in separate folders] needed to be redrawn. Having worked in a library many years ago, I also made sure the patterns were put back in alphabetical order. 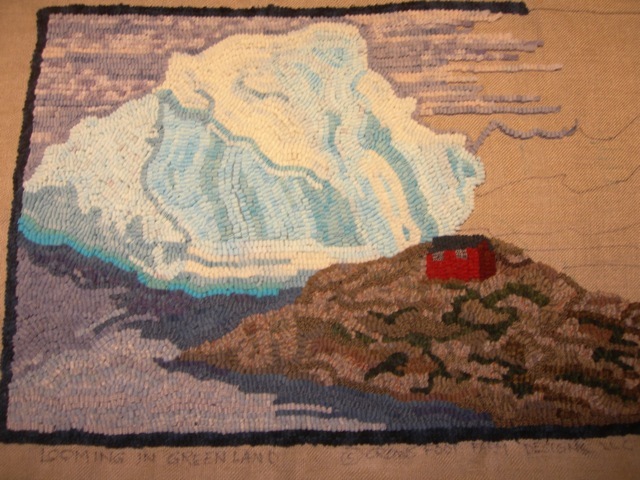 Studio cleanup didn’t take as long as I anticipated, so I did get some hooking done on my Looming in Greenland piece. I finished hooking the grey and threatening sky. I don’t enjoy hooking in straight lines, but it seemed a good way to make a visual separation of the sky and the iceberg. I hope to have this piece finished in a week or two. My next piece will be a lot more colorful, which will be fun. I hope your weather is a bit milder after the cold snap we just had. I’m going to start looking for signs of spring, how about you? There’s a lot of beauty out there and in the anticipation of warmer weather ahead. Charlotte saw her shadow, but she wasn’t frightened at all. 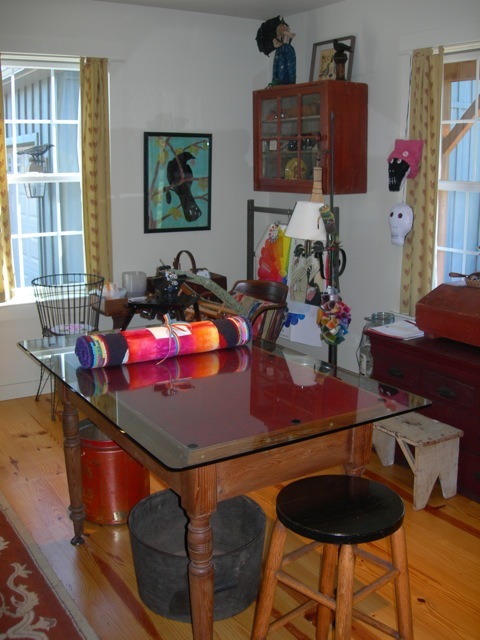 Come into my studio while it’s clean and tidy. A brief neat and tidy view of the studio. I’ve already dragged out some of these tubs. This past week I was determined to finish hooking the biggest chunk of iceberg on my Looming in Greenland piece. I did decide to “reverse hook” a good portion of it before forging ahead. The acronym, NIMBY [Not In My Back Yard] kept running through my brain. Can you imagine seeing this out your back window? If this berg should calve off a large piece, there would be mayhem and danger on this coastal village of Greenland. I also began hooking the sky, which I decided to make grey and threatening to add to the suspense of the piece. The grey also is a good contrast to the brighter color of the iceberg and helps “push” the berg visually forward. 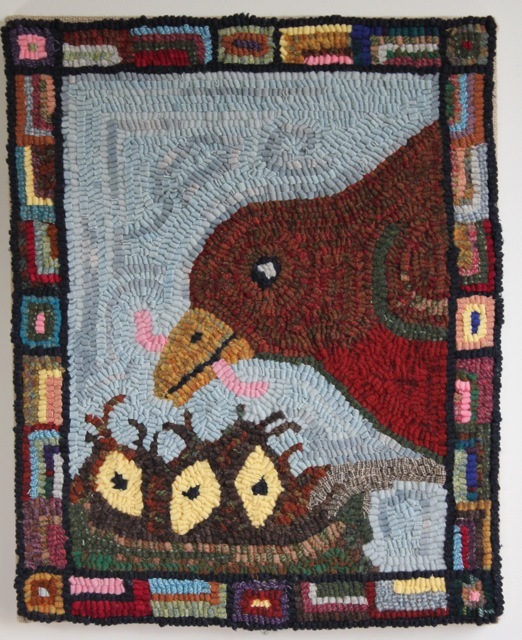 There might not be more progress on this rug this coming week as I’ve decided I need to reorganize my studio. I am not one of those artistic types, who love to be surrounded by messy tools of the trade and partially finished projects. Too much visual clutter confuses me. So, with that in mind, I will be working on boring, but necessary, studio organization this coming week. Although not my favorite thing to do, it will help me in the future to work more efficiently. A forward-thinking customer ordered one of my robin and babies patterns. Spring is coming and it’s a great idea to hook a pattern for the upcoming season. I’ve posted some of my springtime patterns below, which are available on the Shop page of my website. There’s a lot of beauty out there and in planning for the season soon to arrive. 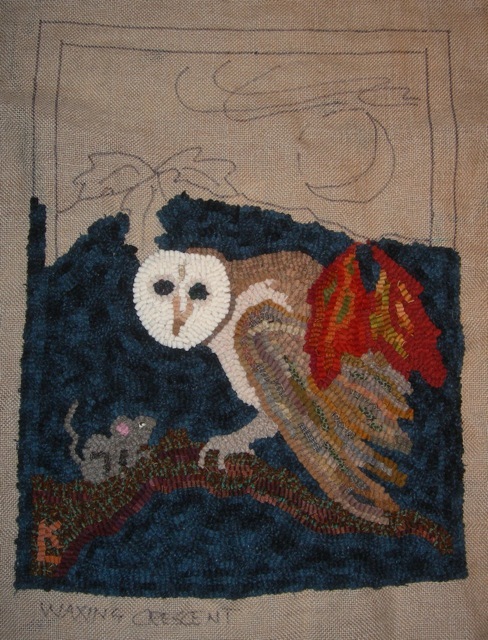 I finished hooking my Barn Owl with Moon2 rug this past week. I was going to wait to bind it at the Brandywine Hook-In later this month, but I. Could. Not. Wait. 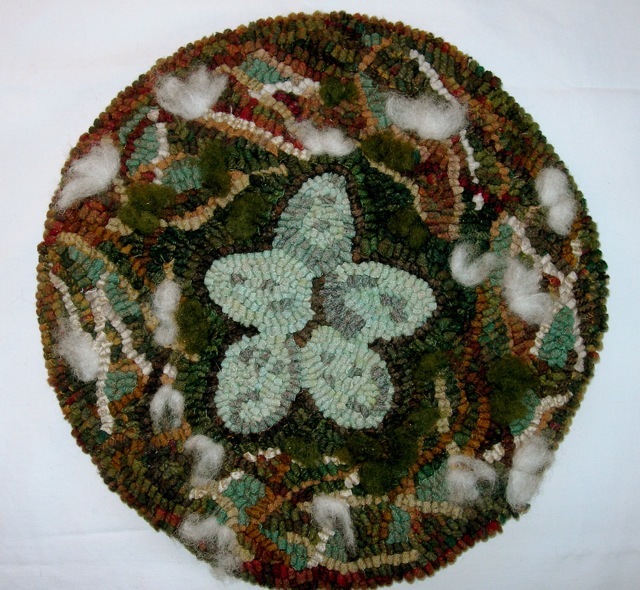 I actually love finishing rugs, so the desire to hold off was overwhelmed by the desire to bind and whip the edge. I guess I’ll have to find something else to hook at the hook-in. There’s a spot on my kitchen floor that has been waiting for this rug, so that, coupled with the fact that I will be hosting my Breakfast Club ladies in a couple of weeks, really gave me an irresistible urge to get this rug done and down. What’s next? I will be hooking my new design, Harvest Moon, in the near future, but I need something else in the meantime. Maybe another piece for my Mother Earth Speaks series? I do have a few ideas bubbling around in my head for that. I’ll see what grabs me. Autumn is here at Crow's Foot Farm, but the temps are still a bit too mild. I hope your autumn is beautiful where you are. There’s a lot of beauty out there and in having a new rug for my kitchen floor. Barn Owl with Moon2 in situ. 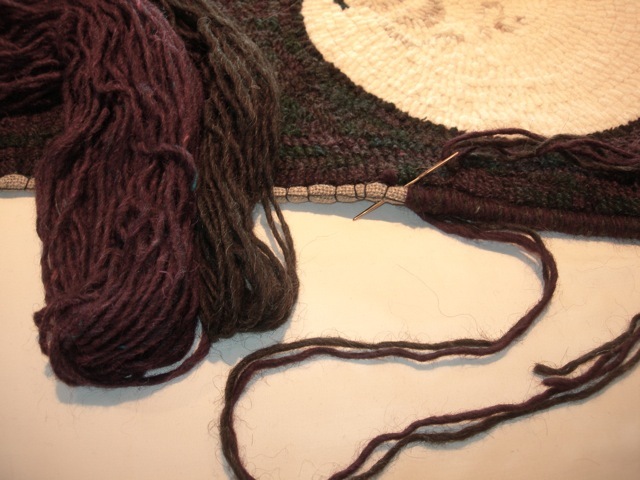 I whipped the edge with two strands of wool, one charcoal grey and one burgundy. 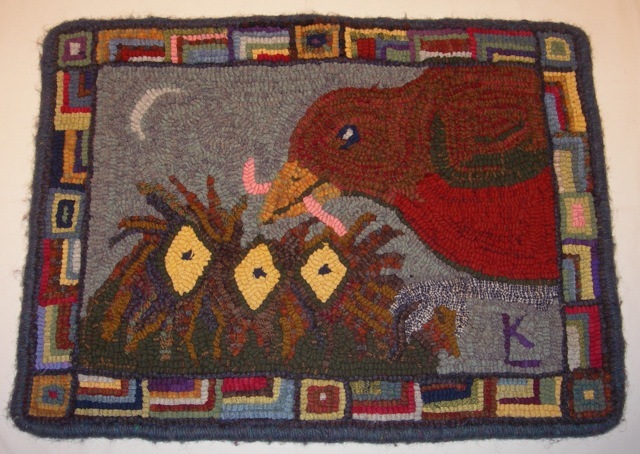 I just completed the wedding gift rug, so a tidying up of the studio is in order. 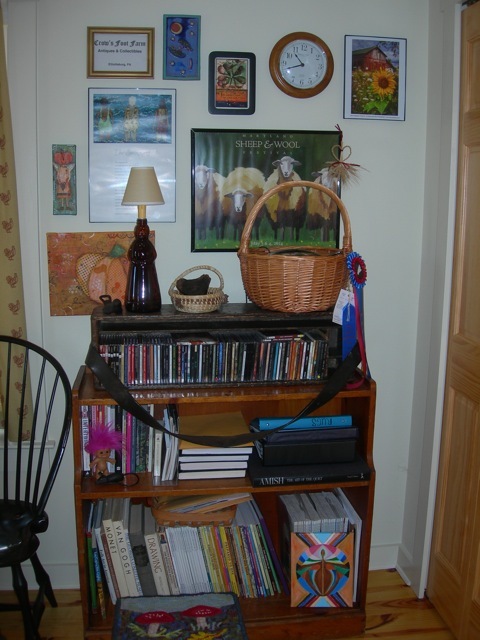 I have to do this between projects to eliminate too much “visual clutter”, which disturbs my OCD. I love my OCD. Also, I’ll be away next week, so I like to leave things in order. 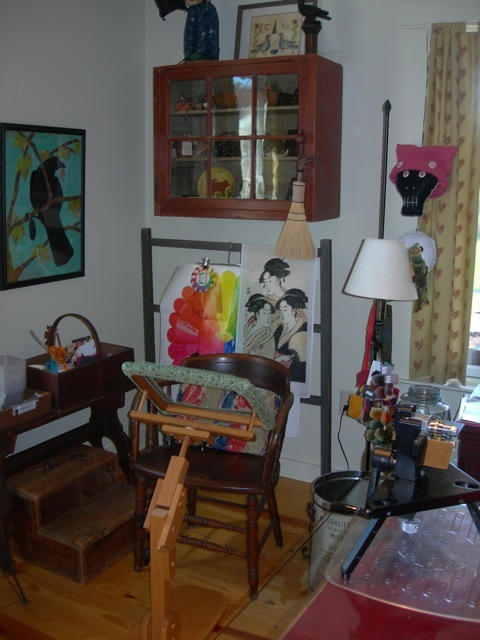 This week I’m sharing photos of my hooking studio, which used to be our attached garage. I love this big room. It even has a sofa bed, for extra guests. Take the tour below as I start packing for my trip. I’ll see you all when I return. There’s a lot of beauty out there and in a neat and organized workspace. I've had this antique table for decades. It now is my cutting table with a large piece of tempered glass on the top. 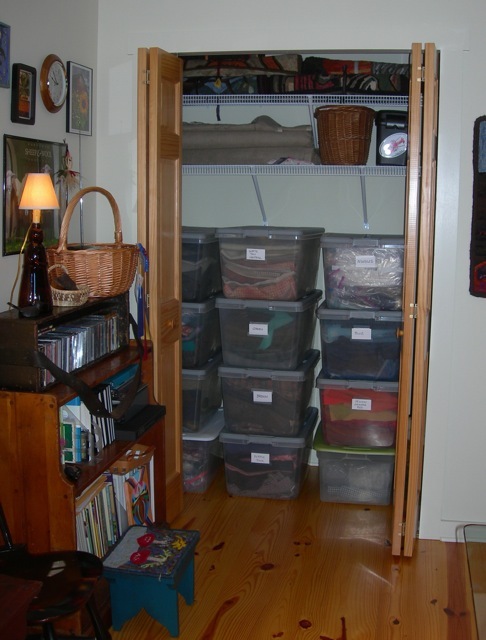 There are three closets in the room. 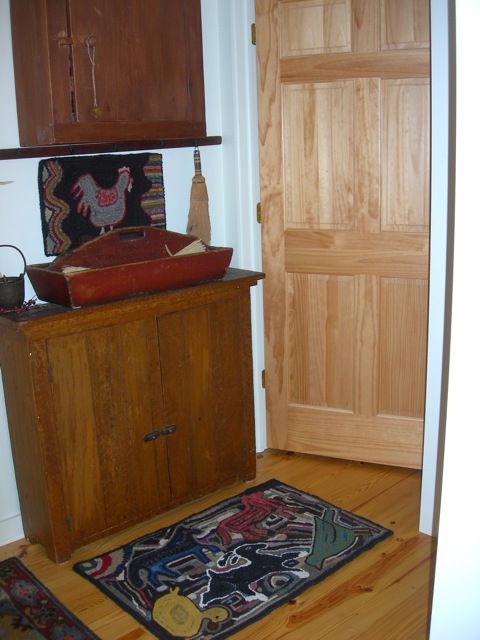 This one holds my wool stash, linen, and rolled up finished rugs. 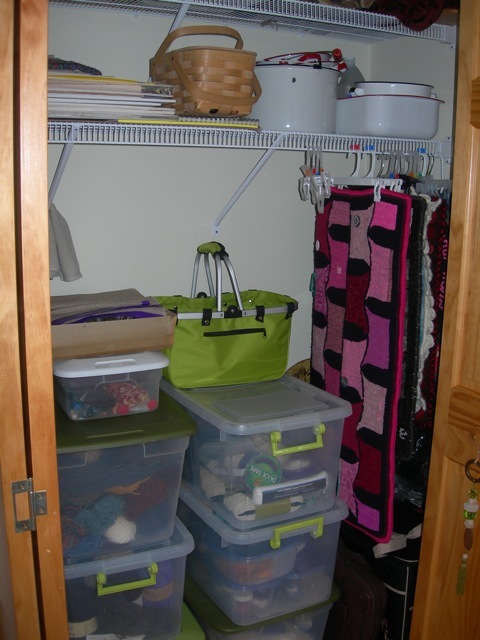 This closet holds dyeing supplies, binding materials and yarn, and you can see that I hang some smaller rugs with "clippy hangers". 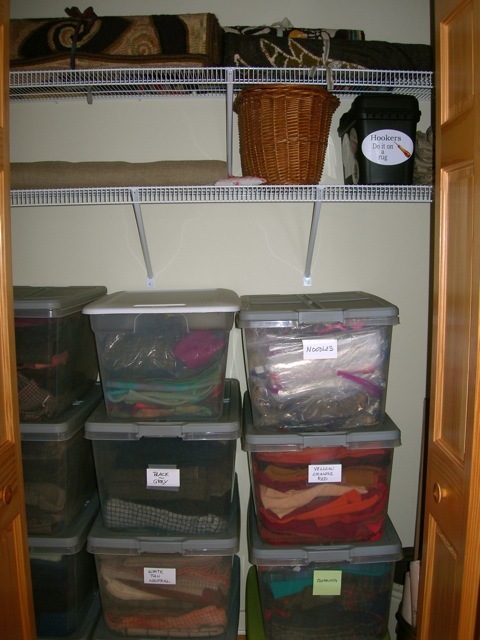 The third closet has my sewing machine set up, so all I have to do is sit and sew. My music and reading material corner. This end of the studio is for relaxing and maybe sleeping. Thanks for taking the tour!